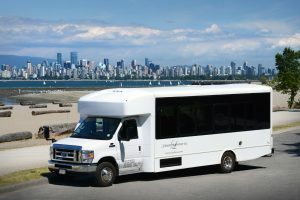 We specialize in private Corporate Site Tours and Vancouver Conference transfers and can take care of your corporate Vancouver shuttle needs and private transportation agendas. Our 8 hour daily rates are perfect for full day corporate site tours and Vancouver conference shuttles where you can specify your preferred itinerary for our team of drivers to accommodate with ease and flexibility. We are happy to help prepare and facilitate the day for you. Ranging from Conference and Convention transfers to facilitating Vancouver airport transfers to Corporate Christmas Party shuttles, we can fulfill your Vancouver shuttle and private transfer needs. We offer a personalized friendly and professional service from your first inquiry to completion of your Vancouver transportation service. Our diverse fleet of SUV’s, Sprinter Vans, Mini-buses and Executive Coaches, can accommodate any group transportation requirement and we work hard to maintain the most competitive rates in our industry. Luxury Transport Inc. is the perfect choice for your Corporate Vancouver day tour or shuttle service. *Based on an 8-hour consecutive service, with the option to add on additional hours needed. Please note, 5% GST tax and driver’s gratuity are extra.